I wrote an article for our internal company newsletter upon returning from SourceCon 2013 in Denver, Colorado. It was my third time attending the conference, and the point where I began to see a theme emerge: Those tried-and-true techniques that humanize the recruitment process really work. I have to laugh at the timeliness of coming across this article now, as many of us are getting ready to head back to SourceCon this week. It makes me think: Despite all the technological advancements in our industry, dare I say “old school” is the new school? Yes, the conference (and our industry in general) focuses on the tools and technologies that enable sourcers and recruiters to do their jobs more efficiently and effectively – and it should. But, what candidates really want these days is to be treated like people—people who actually matter—and no tool can do that better than a human. Not yet, at least. Take a look at the last email or inMail message you sent to a prospective candidate. How personalized was it, really? Not only should you include the person’s name (spelled correctly, please and thank you! ), but you should also include other useful tidbits of information, like why you found their profile appealing and/or why this opportunity might be a good fit based on their profile. To do this effectively, you need to do some homework. Research your candidates on multiple social networks and don’t make assumptions that will have you come across as a spammer. Just because someone has the word “engineering” in their profile does not mean they are, in fact, an engineer. Differentiate: When you are emailing or calling hundreds of candidates a week/month, it is understandable that you might use templates to streamline your communications (in fact, I highly recommend it!). But, when using templates to communicate to the masses, one of the first things that suffers is authenticity. Recruiters and sourcers should attempt to inject a little bit of their personalities into all communications. If you have a decent sense of humor, don’t be afraid to use it. I’ve found that even my corny sense of humor—which admittedly is an acquired taste—helps to break the ice in many situations. Considering all the boring messages people receive every day, authenticity and a dose of humor can go a long way in differentiating yourself from every other recruiter out there. Just be sure it’s workplace appropriate. Network: I know, I know … you’ve heard this one before. But it is so important it bears repeating. ALL the research I have ever read on this topic since the beginning of my career (20+ years ago) suggests referrals are more likely to get hired—and more quickly—than any other source of hire. I don’t think I need to bore you with the stats on this one. And, as a bonus, referred hires are typically lower cost-per-hire and stick around longer once they’re there. Hiring managers are one of the best sources for referrals, but all too often we ask them the wrong questions. Don’t ask a hiring manager if he or she “knows anyone who is looking for a new job.” The problem with that question is that it gets the hiring manager to think only about active candidates – which is clearly not the goal. Instead, ask if they “know anyone who would potentially be a good fit for the job.” See the difference? The second request will get them thinking about anyone who might be qualified vs. just those who are looking. Many recruiters shy away from asking their hiring managers for referrals because they think they will say, “well, isn’t that your job?” The answer is yes; of course it’s our job! But, we’re partners in this “war for talent,” right? And let’s face it: Your hiring manager’s network is probably very different than your own. If asking that question still makes you feel icky, why not do the legwork for them and ask if they would consider reaching out to some people you’ve already identified from their network. While you’re at it, take a look at the groups and networks they belong to and ask which ones they’d recommend for sourcing. There is no one right way to do this, of course. The key here is continuous improvement in our collaboration and partnership with hiring managers. While today’s technology may allow us to reach more people more quickly, we still need to make sure to add a personal touch. 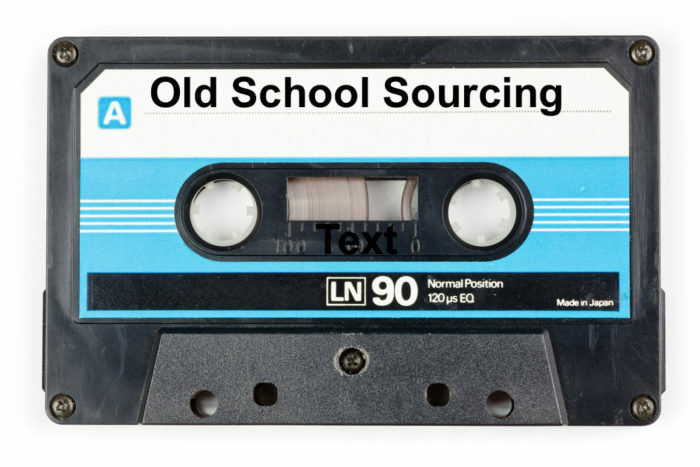 By implementing these three best practices, it will ensure you still have some “human” in the sourcing and recruiting process. Elizabeth McCrea Theodore, SPHR, is a leader in the RPO industry, with 20 years of progressive experience and a focus on the creation and execution of innovative talent identification and engagement and employee development strategies In her current role, she is responsible for the creation and delivery of talent management programs for ManpowerGroup Solutions RPO, and leads several employee development initiatives. She also leads the effort to identify and launch innovative technology strategies to enable RPO delivery operations.